First get your area nice and ready, remove all the weeds and add new soil if you need to. 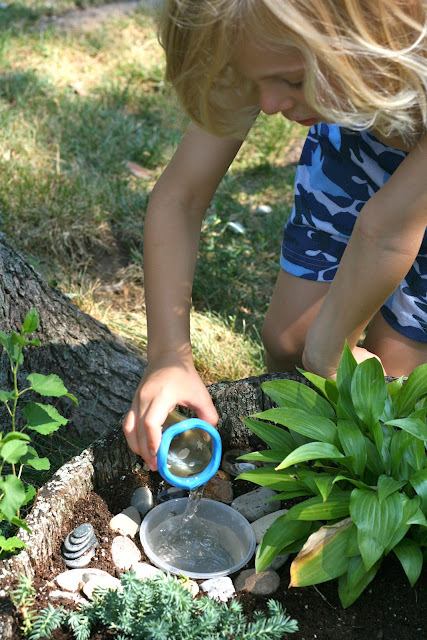 Then help the kids decide what fairies need in order to enjoy your garden. Their first response was swimming pool! We added a plastic container that will serve that purpose. I am hoping to find a small ceramic one to give it a better look. We decorated the area with small pebbles we found on the Lake Michigan Beach earlier this summer. Sorry for this blurry picture, but I tried to capture the garden at night, all lit up. It looks magical. And did you notice the small chair? lol - the kids found it in Target in their dollar section (it's really a cell phone holder) and they thought it would be a perfect lounge chair for the fairies. I was hoping for something wooden but you can't say no to those begging little eyes! Now we are looking up what fairies like to eat so they really like our garden the best!! !